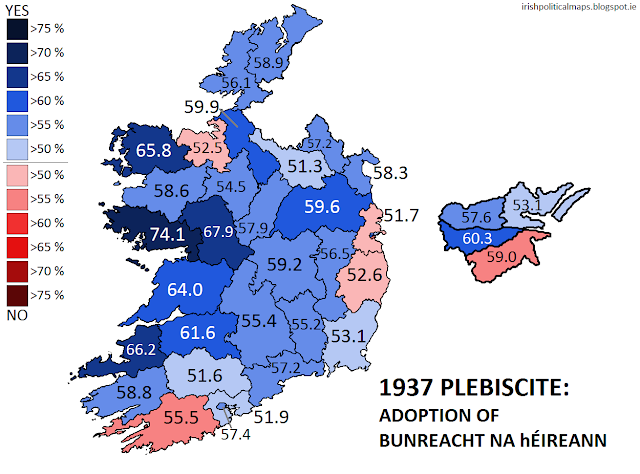 On 1 July 1937, the Irish electorate were given the opportunity to vote for or against Bunreacht na hÉireann, the new draft constitution created by President Éamon de Valera. The new document was designed to replace the existing Constitution of the Irish Free State, which was felt to have become outdated having undergone strenuous amending during the 1930s. In the 16 years since the creation of the Free State, the role of the United Kingdom in Irish affairs and the role of the Free State in the Commonwealth had been altered considerably. The new constitution would be a new start of sorts - illustrated by the rebranding of several official terms: the President of the Executive Council became the Taoiseach, the Vice-President the Tánaiste, and most importantly, the Irish Free State became Éire (Ireland). The constitution also created a new office of President to act as Head of State, effectively replacing the office of Governor General, which had previously represented the British monarch in that capacity. Controversially, it also proclaimed the national territory to constitute the entire island - a feature which did not find favour with the government of Northern Ireland. Though it faced a degree of criticism from the Opposition parties, unionists and farmers, the constitution was approved by a margin of 13% and was officially enacted on 29 December of that year. It remains in place today. Do you approve of the Draft Constitution which is the subject of this plebiscite? Out of the total valid poll, 56.5% voted Yes and 43.5% voted No. Turnout was at a remarkable 75.8%. The highest recorded result in favour of the constitution came from Galway West, with 74.1% voting Yes. The highest recorded result against it was 59.0% in the Dublin Townships. The 1937 Constitution, as it was when it was put to the people. The 1937 Constitution as it is today.